President Donald Trump has focused heavily on immigration issues in the run-up to the Nov. 6 midterm elections, warning of an "invasion" of Central American migrants, sending thousands of troops to the border, and reviving talk of eliminating birthright citizenship for children of undocumented immigrants. Experts on governance and politics are mixed as to whether Trump is playing politics, appealing to his base to boost enthusiasm in the election, or responding reasonably to a need to protect the integrity of the country's borders. 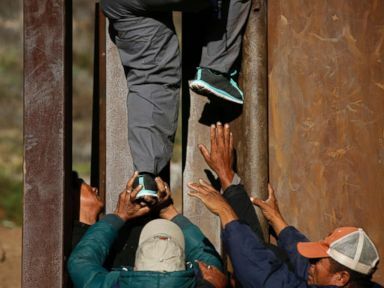 James Campbell, a professor of political science at the University at Buffalo, said the emergence of a caravan of Central American migrants earlier this month “forced the issue” of immigration to the forefront. “I can understand why [Trump's response to the caravan] could be seen as harsh but I’m not sure how he could do anything other than defend the border,” the professor said. Trump has warned repeatedly about the threat posed by the thousands of men, women and children, mostly from Honduras and Guatemala, who are slowly making their way north through Mexico, mainly on foot. Once 7,000-strong, the group has dwindled to about 3,500 people, many of whom say they are escaping poverty and violence in their home countries. In anticipation of a large group of these migrants reaching the U.S.-Mexico line, which is not expected for weeks, the president this week ordered thousands of American troops to the border. In contrast to Campbell’s view, some experts said Trump's rhetoric has political aims. The deployment of thousands of active-duty troops at the border serves the president's purpose of raising public fears of the migrants, she said. “Calling in the military for support makes it sound like there’s an invasion even though the military can only play a secondary role” in securing the border, she said. U.S. law restricts the military from engaging in law enforcement on American soil, so the 5,200 troops being sent to the Mexico-U.S. line will be limited to duties like helicopter support for border missions and building barriers at the border. Kamarck said that, considering in this case a large group of migrants are coming together, the U.S. would need to beef up its staffing at the border to process people's applications for refugee status or residency. “He does need to get more people at the border because of all the people deciding to come at once, but he’s not saying ‘I’m going to get a thousand more people down at the border to process all the people.’ He hasn’t said that because it wouldn’t be as scary,” she said. Similarly, Hans Noel, an associate professor of government at Georgetown University, said the appearance of the caravan so close to the midterms was “perfect timing” for the president. “It’s pretty clear that Trump and his circle believe that the way to energize voters and the way to win elections is to talk about immigration and be tough on immigration,” Noel said. 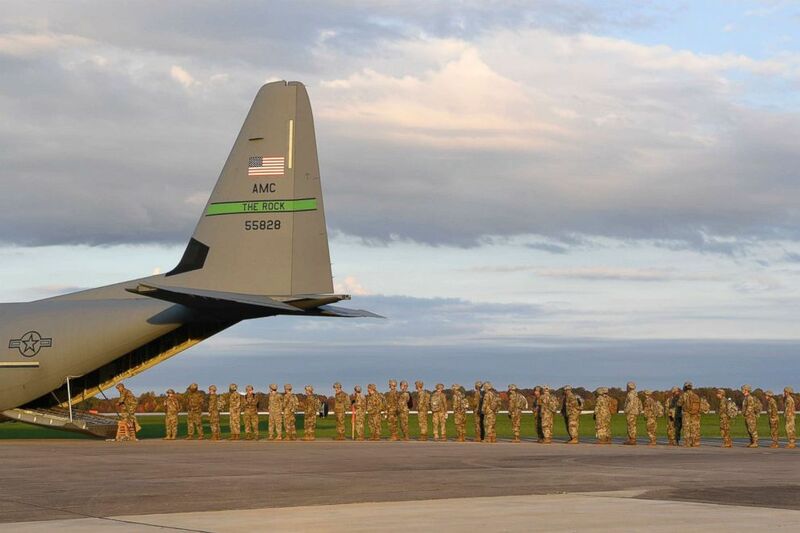 Soldiers assisting the Department of Homeland Security along the southwest border board an Air Force C-130J Super Hercules at Ft. Knox, Ky., Oct. 30, 2018. But the president's rhetoric about immigration also reflects real policy goals, the Georgetown professor said. Trump's floating the idea of restricting birthright citizenship, for example, could be among “actual policy moves that are meant to accomplish the goals” of his administration, Noel said. Birthright citizenship grants children born in this country full rights as citizens regardless of the immigration status of their parents. “Trump and a lot of people in this administration actively want to reduce immigration, actively want to reduce the number of asylum-seekers that are arriving,” Noel said.